The CAM walker stands for controlled ankle movement. Cam walkers are used by people that have a wide variety of foot and ankle injuries. They are also utilized to support and look after immobility of a wounded foot. Cam walkers are utilitized for numerous medical problems such as sprains, fractures, achilles tendon issues and diabetic ulcers. They are also great tools for those who recently had surgery, such as, bunion/hammertoe surgery. Cam walkers are highly preferred over hard casts for many reasons. For starters they are removeable! Being put into a sold cast for weeks can seem like such a daunting task. Having a removeable walker, which can be taken off for showering, is much more conducive to everyday life. A cam walker includes a rocker bottom. The nice thing about this rocker bottom is the fact that it aids you in gaining some natural flow in your walk.A hard cast can completely alter the way you walk. Also, cam walkers come with different features. There are short or tall and even an air pump feature. The air pump feature can greatly increase the healing time for post op patients. 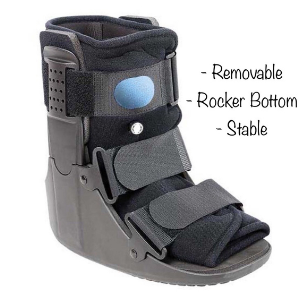 Also, the boot holds the foot in a complete 90 degree angle which is optimal for post-op healing. Immobility is the most important prerequisite that's completely satisfied by a cam walker. If you find yourself affected by a sprain or fracture, a cam walker is just what you will want. A sprain in the foot or ankle is often curable with a cam walker. If you recently had a foot or ankle injury or if you are having a foot or ankle surgery, you should discuss the use of a cam walker with your doctor. The benefits far outweigh the use of a hard cast! Dr. Brad Schaeffer is an expert in foot and ankle pain, treatment and surgery. Learn more about our doctor..
Posted on 03/19/2018Do You Have Pain On the Ball of Your Foot? ?What is the Difference Between a Fracture and a Break? ?Do I Have to Sleep in My CAM Walker? ?Do I Need to See a Podiatrist if I Have a Broken Toe? Posted on 10/26/2017 Ouch! Is my toe broken?! Posted on 03/10/2014 Are You Sure It's Just a Simple Ankle Sprain? Posted on 01/14/2013 Why Isn’t My Ankle Sprain Getting Better? What Your Doctor Might Have Missed.